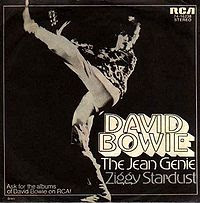 No, not Jean Genet, not David Bowie, not Eugene Finkelstein (my lab partner in 4th grade), and not even the 19th-century French novelist Joseph Marie Eugène Sue (though you are definitely getting warm). 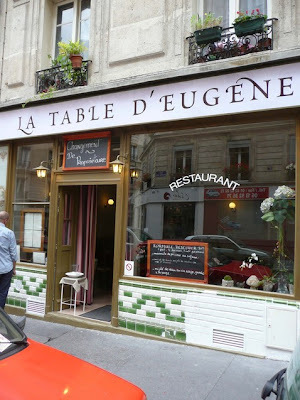 No, La Table D’Eugène, an increasingly popular little bistrot in a multi-cultural section of the 18th is named after the street on which it rests, rue Eugène Sue, numero 18 to be precise. Co. and I reserved for Friday night, first serving (19h45; a second serving commences at 22h), and walked the short 1-1/2 blocks from the Marcadet-Poissonniers metro, nearly in the shadow of the Sacre-Coeur and the touristy district of Montmartre, huddled together in the still cold Parisian air, unaware that we were heading to our best meal of the still young year. 1. Impossible to reserve (paris.menupages.com) – Not! 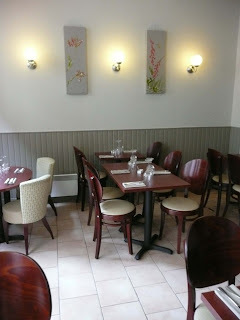 While this complaint may accurately reflect the rising status of the venue, this reviewer had no difficulty reserving a table for two at either serving four days before said reservation. True, it was packed by the time we left (and when a party of six arrives at 21h15, does that mean they are late for the first serving, early for the second, or just plain idiots?). If you wait the day before to reserve, or even worse as I watched a couple couples turned away at the door without any reservation at all, well, there’s always the shish-kabob place around the corner. 2. Too expensive (hungryforparis.squarespace.com). Nuh-uh. Everything’s relative, and as my long-deceased relative Aunt Rose (ex-owner of a steak house in Huntington Beach, CA many, many years ago) used to tell me, “In this life, Mort, you get what you pay for.” Our bill for two 35€ menus, a 23€ bottle of Vin de Table Sorga red, a 3€ supplement for a rabbit entrée, and two post-hoc cafés came to an incredibly reasonable 102€, pretty par for a just short of Michelin star-friendly meal, and more affordable than other lesser quality bistrots I’ve frequented over the years. And while I’m ranting, I’m surprised that Alexander Lobrano, author of the hungryforparis site, whom I generally find to be a very knowledgeable and engaging authority on French restaurants, also got the wine list wrong as well, calling it “top heavy”. I found an affordable bottle in nearly every category (25-35€), leading to a much wider and affordable selection than you’ll find elsewhere. Don’t get me wrong – Lobrano and I do agree that Eugene is a top spot. 3. Service is slow. (www.eat-out.net). Once again, I beg to differ. If attentive service is one’s definition of ‘slow,’ well then I give up, it’s slow. 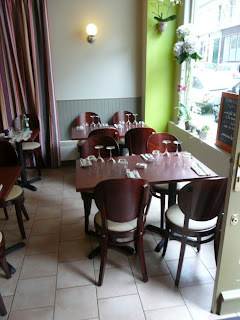 Two young servers among the best I can remember in a long time in a Paris venue proved efficient, not slow. Strange as it may seem, they really seemed to care. For example, as I settled into the wine list and pointed to a Cote du Rhone, our server seemed perplexed, ultimately dissuading me, explaining how the wine would definitely conflict with our dinner selections. I’m not one to nitpick when it comes to mixing and matching, but I had to let expertise take the place of valor when the server started raving about a cheaper, that's right, cheaper Vin de Table (which I never, ever would have considered, equating that term with a 3€ Fran Prix supermarket special), the aforementioned Sorga, and how it was the first run of an upstart southern vinyard that would superbly complement our meal. As I tasted the Sorga, he began to explain the taste, it’s piquancy, how it would yield a somewhat sparkling gaseous sensation under the tongue, and by the time I swallowed, he had perfectly nailed what had just transpired in my mouth but which I could never have adequately described on my own. I wonder how do they do that? He assured us that the sparkling sensation would subside after a few minutes of aerating the bottle and sure enough, it did. Okay, granted, it’s not like you don’t get recommendations from sommeliers in Paris restaurants, but this server and his partner throughout the meal kept checking, explaining, and lingering unobtrusively just to be sure, even when the room filled up, no copy of War and Peace required. 4. Colorful entrées almost make up for uneven main courses. (Fooding, Le Guide France 2010). If this ever was true, it either isn’t anymore, or the main dishes that Co. and I selected were just lucky choices. In fact, I think we both preferred the main course to the entrées, which isn’t intended to deride the latter. I could go on, but it’s getting late and I really should start talking about the food, which, in fact, I already have begun to do. If there’s one thing I’ve learned since creating this site it is this: My handwriting after a few drinks is as bad as it is when I wake up in the middle of the night to scrawl down my next Pulitzer-ready idea, only to find complete gibberish in the light of the morning. So, until I find a better system, please bear with the following description, taken from my hastily jotted scribblings. Co. launched her meal with a rabbit dish, with the rabbit cooked two ways, a rable de lapin and lapin farcie with veal and ginger. This was an originally prepared and satisfying starter and probably eked out my choice, but only barely. I opted for a dish of gambas and chiperons, elegantly arranged on a bed of tiny vegetables. The chiperons were perfectly cooked, without the rubbery quality one often finds, and once consumed, the plate surprisingly held the remnants of an excellent balsamic (I think) based sauce that required three good sized scoops of the tablespoon. That leftover sauce was worth the price of admission in and of itself. Co. followed up with the roti bar on a bed of chou vert and spume and the following praise: ‘excellent, definitely, extremely tasty and tender.’ Thanks, Co. As for me, I keep heading in the direction of magret de canard, don't ask me why, it's just the way things are these days. My incoherent notes seem to suggest that the magret came with "eamach with greia”, which for all I know could be Gaelic for something tasty, but probably is just the Sorga talking. I do remember, aha, that the rosé-cooked magret was a pretty significant slab, topped with its crunchy skin and accompanied with pear soaked in wine and pear not soaked in wine, as well as a rectangular-shaped, slightly grilled rack of polenta. Overall, the combination was superb, although I’d still love to remember what that eamach with greia was all about. Where did I read that Eugene’s desserts were disappointing? Au contraire, I am happy to report. Our dessert choices turned out to be the highlights of our meal, both the citron with sable dish and the chocolate dessert, but especially the chocolate dessert, which arrived as what appeared to be a medium-sized scoop of chocolate ice cream, but once topped with a cacahuète-based sauce at the table, magical things started to happen, recalling that Sorga-induced tingling sensation in the mouth and a crunchiness from somewhere. This was a metamorphic and memorable dish. Overall, if you haven’t figured it out yet, our experience at TDE was really top notch, not yet at the level of a Michelin star, but it may not be long. The Fooding 2010 guide concludes its review with “Keep trying, Gene, you’re getting there!” Well, it’s probably gotten closer, and let's not forget that it is only a small step from genie to genius. A mise en bouche and/or a couple pastries with the café wouldn’t hurt, and what do Parisian restaurateurs have against music? With a relatively young, contemporary clientele, some cool vibes could boost the already convivial atmosphere.